Repair Location is a geographic area where your clients’ vehicles are serviced by internal or vendor team of employees. On the Repair Locations page you can add, edit, delete, and search repair locations. To add a new location, click Add on the toolbar, enter settings, and click OK.
To modify an existing location, click Edit next to the appropriate location, change settings, and click OK.
To delete a location, click Delete next to the appropriate location, and click OK in the message box. To search for a location, in the Search pane, click All, Active, or Not Active in the Status box, type location name or its part in the Location box, and then click Search. When you create a new location or edit an existing location, you enter or change settings in the location profile. Auto Close Completed ROs turns on automatic closure of repair orders when their services and phases are completed. In the After Days box you can specify how many days completed repair orders remain open for changes before automatic closure. Department is a repair location unit that can be assigned to particular phase, so that when a repair order moves from one phase to another, it also automatically moves from one department to another. On the Departments page you can add, edit, and delete location departments. Also you can sort departments to show them in particular order. To add a new department, click Add on the toolbar, enter settings, and click OK.
To modify an existing department, click Edit next to the appropriate department, change settings, and click OK.
To delete a department, click Delete next to the appropriate department, and click OK in the message box. To sort departments, click Up or Down next to the appropriate departments. Note You can click Set as Default next to one of the departments to make it default for the given repair location. Acceptance Required defines whether moving of repair order from one department to another must be accepted. Phase is a group of logically related services that when completed can move the repair order to the next phase within its life-cycle. On the Phases page you can add, edit, and delete repair order phases. Also you can sort phases if they should follow one another in a specific order. To add a new phase, click Add on the toolbar, enter settings, and click OK.
To modify an existing phase, click Edit next to the appropriate phase, change settings, and click OK.
To delete a phase, click Delete next to the appropriate phase, and click OK in the message box. To sort phases, click Up or Down next to the appropriate phases. 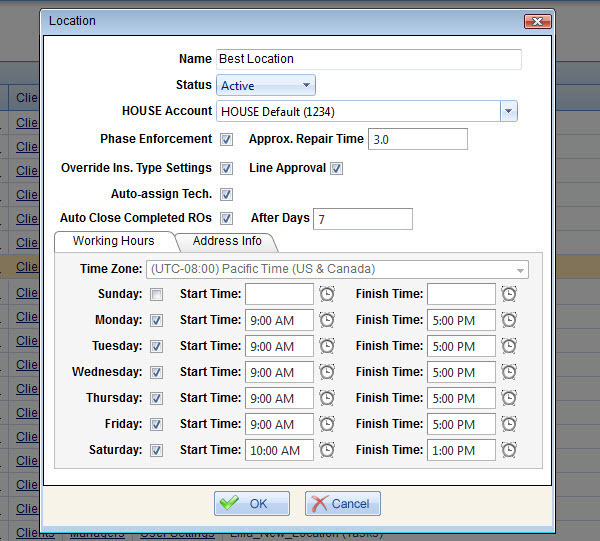 Note Each repair location has default phases that you cannot sort because they are logically the next to the last and the last phases in the repair order life-cycle: during the QC (Quality Control) phase the quality of the repair order works is verified, and the Completed phase means that the repair order is completed. When you add a new phase or edit an existing phase, you enter or change settings in the phase profile. Pre-repair means that the vehicle is getting ready for repair, for example, washing it before painting. In Progress means that the vehicle is in the process of being repaired. On Hold means that repair process is paused, for example, while waiting for delivery of vehicle parts. QC means that quality of the repair order works is being checked. This type is used for the default QC phase. Completed means that the repair order is completed. This type is used for the default Completed phase. Due Bill means that repair order is waiting for payment. Required means that you must Check-Out the vehicle to start repairing it in this phase and then Check-In the vehicle when you finish repairing it. Optional means that you can either use the Check-Out/Check-In option or not when you start and finish repairing the vehicle in this phase. N/A means that the Check-Out/Check-In option is not available for this phase. Task is a non-billable job that can be done and tracked within the phase, for example, “Vehicle interior ventilation after painting”. On the Tasks page you can add, edit, and delete phase tasks. To add a new task, click Add on the toolbar, enter task name, and click OK.
To modify an existing task, click Edit next to the appropriate task, change task name, and click OK.
To delete a task, click Delete next to the appropriate task, and click OK in the message box. On the Phase Services page you can assign services to phases, so that when you add services to a work order, these services are automatically allocated among phases while repair order monitoring. On the Phase Services page, in the Location box, make sure that the given location is selected. Note If work order type includes bundle services, bundle service items are shown separately and can be assigned selectively. Tip You can select other locations and assign services to phases in these locations (no need to open the Phase Services page for each and every location). On the Clients page you can list the clients which vehicles can be serviced in the given repair location. If you don’t add any client to the list, the given location will be available for all clients. Click the down-pointing arrow in the Enter a customer box, click the appropriate client, click Add; and then when you add all the clients that you want, click Update Clients. Click Delete next to the appropriate client, and click OK in the message box. Manager is an employee who can receive email notifications for events related to the given repair location. Click the Team box and click the appropriate team or All; click the Enter an employee box and click the appropriate employee, click Add; then when you add all the managers that you want, click Update. Click Delete next to the appropriate manager, and click OK in the message box. Hide WO amount option doesn’t show the work order amount to client users. Hide WO print button option doesn’t let client users print out the repair order. 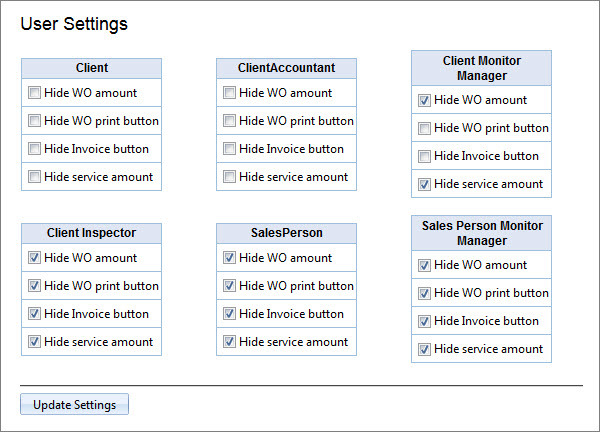 Hide Invoice button option doesn’t let client users to open the invoice printout. Hide service amount option doesn’t show the service price to client users. Select the check box next to the appropriate options for the appropriate client user roles, and then click Update Settings.